Today would be the 260th birthday of the 4th American president, James Madison. Long honored as the “Father of the Constitution” for his role at the Federal Convention of 1787, Madison is also regarded as the most thoughtful and creative constitutional theorist of his generation. This reputation owes much to his celebrated contributions to The Federalist, the set of essays that he wrote with Alexander Hamilton and John Jay in support of the Constitution. 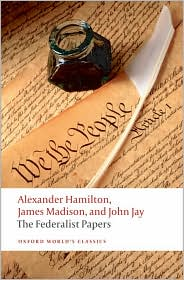 Two of these essays, the 10th and 51st, are widely viewed as paradigmatic statements of the general theory of the Constitution. Some time ago on OUPblog, Lawrence Goldman explained how reading The Federalist Papers can further an understanding of present-day America. Madison’s political career during nearly half a century is interesting for the way in which it combined deep reflection about constitutional principles with the exigencies of public life. To celebrate his birthday, I’ve gathered some quotes from The Federalist Papers, and a few others I found scattered amongst the pages of the Oxford Dictionary of American Quotations (2nd ed, 2005) and the Oxford Dictionary of Quotations (7th ed, 2009).